As you can see by the above, my major ongoing expense is AdWords, as usual. 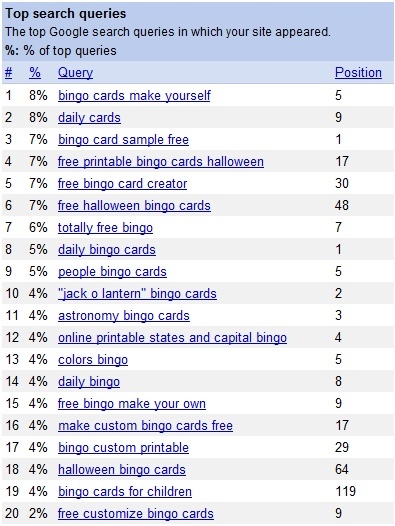 The majority of the charges associated with Daily Bingo Cards are not going to be recurring, although I do have agreements with two of my freelancers to provide me 30 bingo cards a month at $2.50 each, so that is an ongoing commitment of $150. That is slightly more than I had been paying when I started but I was pleasantly suprised at the quality I was getting and am willing to pay for it. Plus, look at it this way — I only have to pay to get the cellular biology activity written once, but it will be up for years happily collecting downloads. At my typical 2.5% conversion rate, I break even on a bingo card which delivers about four trial downloads. Several have already done so. Other than the cards, my only ongoing cost for DBC is the Slicehost hosting, a steal at $20, so the first sale a month goes to hosting/domain renewal fees and it is all gravy after that. It is often said by quite knowledgeable SEOs that you can’t rank for anything of importance in less than about a year and a half. That is probably quite true if your definition of something of importance is [California mortgage] or [buy wii] or something else with obvious commercial relevance. For my business, queries like the ones you see above (and the 80 I’m not showing you because stitching together JPEGs is not an effective use of my day) are the important ones. Let other folks fight it out over [bingo cards] and its 8% conversion rates — my snowflakes do about triple that, you can rank for them in a week, there is no competition, and the volume will be quite nice after I start ranking for even more of them.